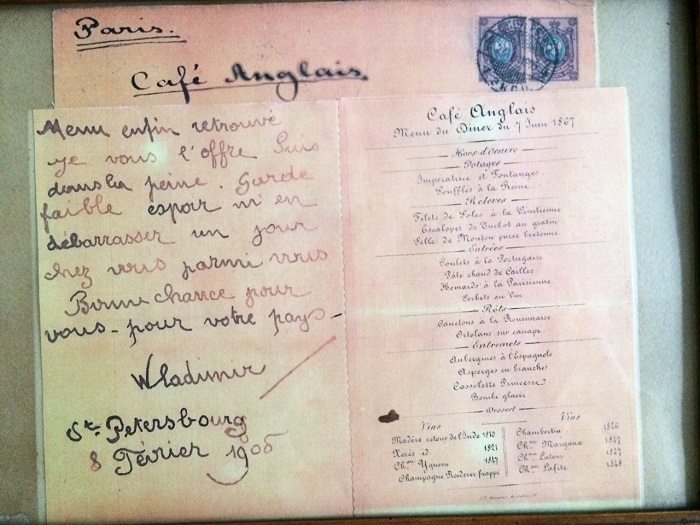 André Terrail, grandfather of the current owner, contributed to the legend of the Tour d’Argent the recipes of Adolphe Dugléré as well as the fabulous bottles of the Café Anglais. The Tour joined this tireless entrepreneur’s collection of prestigious establishments such as the Georges V, the San Régis and the Bellman Hotels in Paris, the St. Christophe Hotel in Miramar d’Esterel, the restaurant l’Escargot Montorgueil and the traiteur Potel & Chabot. In 1947, André Terrail handed over the reins to his son Claude who would expand its international prestige. It was under Claude Terrail that the Tour d’Argent opened a second restaurant in Tokyo, celebrated its 400th anniversary, and underwent a series of major evolutions that kept the Tour d’Argent at the pinnacle of the international gastronomic scene. He was a visionary, a leader, but above all an epicurean whose favorite maxim was “There is nothing more serious than pleasure”. He passed away in 2006, and his son André, took over at the helm. André Terrail joined the family business in 2003 and became President in 2006, succeeding his father and opening up a new chapter in the history of this illustrious establishment. As tastes and lifestyles of the upcoming generation have evolved he has brought about many changes, all the while meeting the demanding requirements of the clientele and respecting the restaurant’s heritage. André Terrail holds a Bachelor of Science in Business Administration from Babson College and a Master of Business Administration from INSEAD. Every tower has its very own legend and ours is certainly no exception. For nearly a century now, through the vicissitudes of history, the Tour has maintained tradition and honor, approaching worship. For the establishment’s age and the authenticity of the anecdotes surrounding it, in the end, count less than the living fervor that André Terrail knew how to foster, followed by his son, Claude and now André. 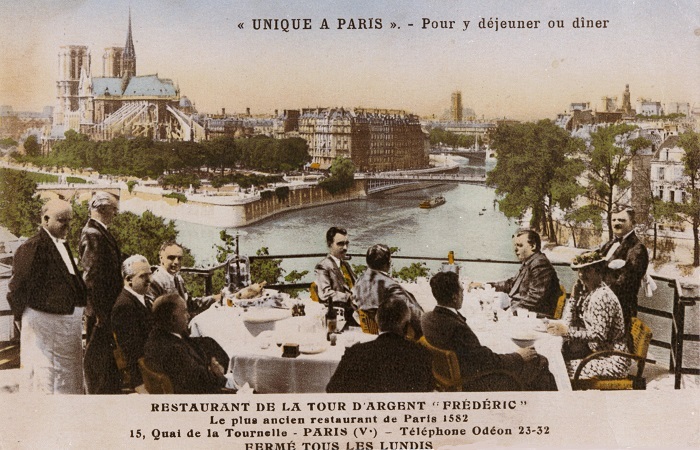 Time and celebrities come and go, menus and fashions change but the table remains set at the Tour d’Argent. Under the reign of Henry the 3rd, facing the wine docks just after the Saint-Bernard Gate, Rourteau opened an elegant inn that would welcome noblemen tired of haunting the dirty and ill-reputed taverns. The nearby Château de la Tournelle had been built with stones from the champagne region nearby that had some silvery reflections in the evening. It would give the establishment its name “L’Hôstellerie de La Tour d’Argent”. Already used in some homes in Italy, the fork made its first appearance in France at the Tour d’Argent. It was a remarkable invention to prevent gentlemen from staining the immaculate fashionable ruff worn around the neck. 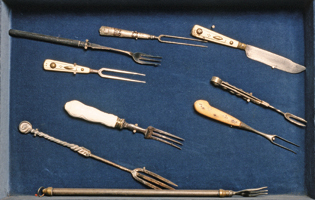 Henry IV inaugurated the amazing piece of cutlery at a much talked about dinner in Paris. From that evening onwards, the Tour d’Argent could not be ignored and Henry IV came regularly to savor the heron pâté, which made the reputation of Rourteau, the owner of the establishment. 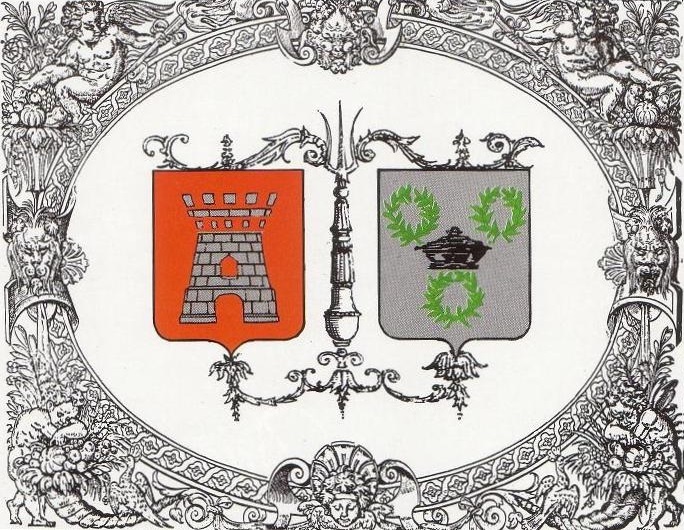 The very same Henry IV granted the Tour d’Argent an emblem. The crest, “Cuisinier-oyer-traiteur”, hung above the door of the inn till the reign of Louis XIV. The emblem of the restaurant was “a dish covered in sand accompanied by three crowns of ivy and sinople, completely in silver” while that of the inn was “a crenellated silver tower in a field of snap dragons”. The Tour d’Argent remained the place to savor refined suppers. Archived Writings carry traces of a dinner hosted by the Duke of Richelieu, nephew to the Cardinal that brought together 40 people around a menu composed solely of beef, prepared in thirty different ways! Excellent hot chocolate, too, was to be enjoyed at the Tour d’Argent. 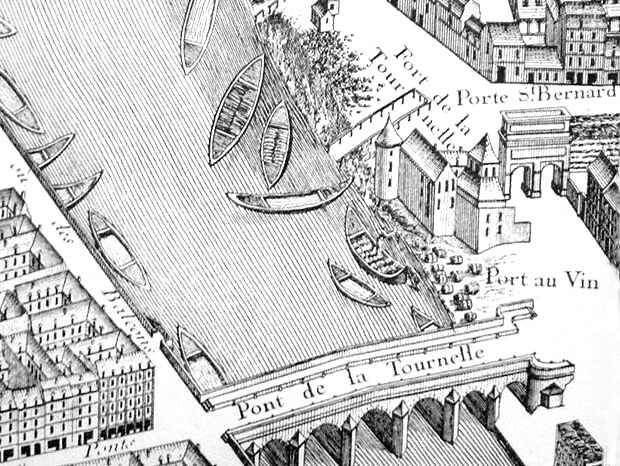 In a letter written in 1671, Mrs. de Sévigné wrote to her daughter Mrs. de Maintenon that she drank her hot chocolate daily at the Quai de la Tournelle. With the turmoil of the Revolution a thing of the past, Lecoq, Head Chef of the imperial kitchens, re-built the restaurant in 1830. The establishment was once again celebrated by gourmets like the Duke de Mornay and the Countess le Hon, The Lady of the Camellias, and even Lord Seymour. 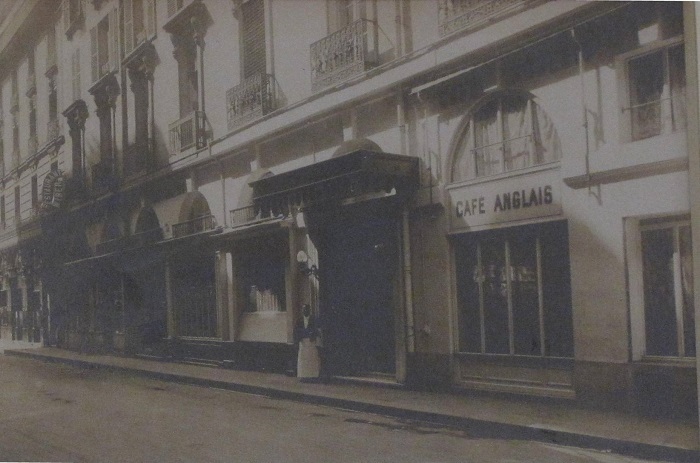 It was in 1867 during the Paris World Exhibition that the Cafe Anglais was at its apogee. Witness! One fine day?, Alexander II, Czar of the Russian Empire, the Czarevitch and future Alexander III, William I, King of Prussia and future Emperor and the Prince Otto von Bismarck sat down at the same table. For these illustrious guests, Dugléré, the Chef, prepared an equally exceptional menu with nothing less than five starters, six main courses and four deserts. Under the helm of this headwaiter turned owner of the Tour d’Argent in the middle of the 19th century, table service took on a new dimension. 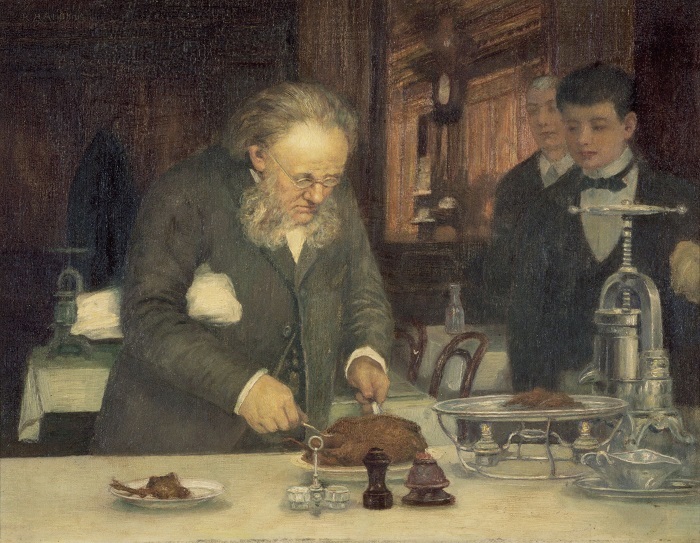 Frédéric introduced the carving of a duck on the end of a fork without allowing it to touch the platter. He codified the recipe of the “pressed duck” or “duckling Frédéric Delair” as we know it today and was so certain of the durability of his endeavor that in 1890 decided to give each duck served a number. 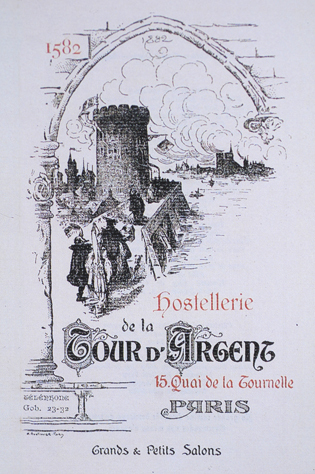 In 1911, André Terrail bought the Tour d’Argent from Frédéric Delair. 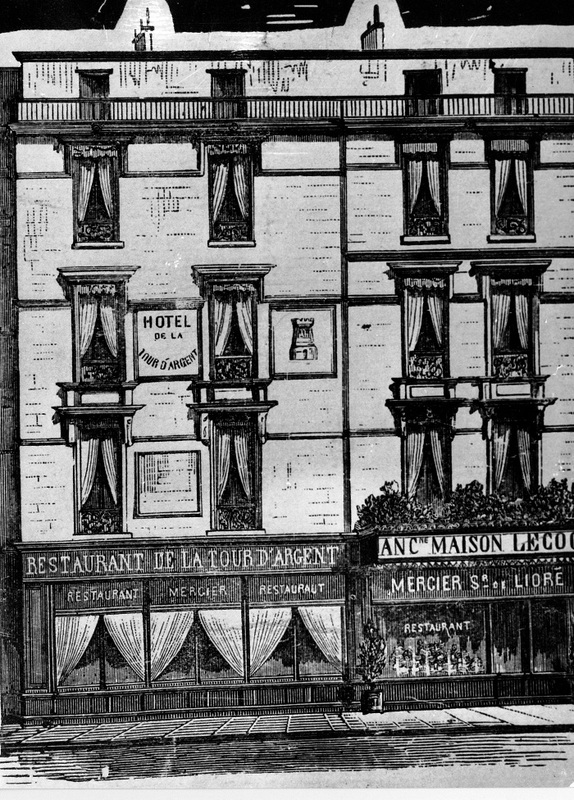 His marriage with the daughter of Claudius Burdel, the proprietor of the Café Anglais at the time brought together the gastronomic heritage of Frédéric Delair and the equally illustrious Adolphe Dugléré, the Chef at the Café Anglais during the Second Empire. 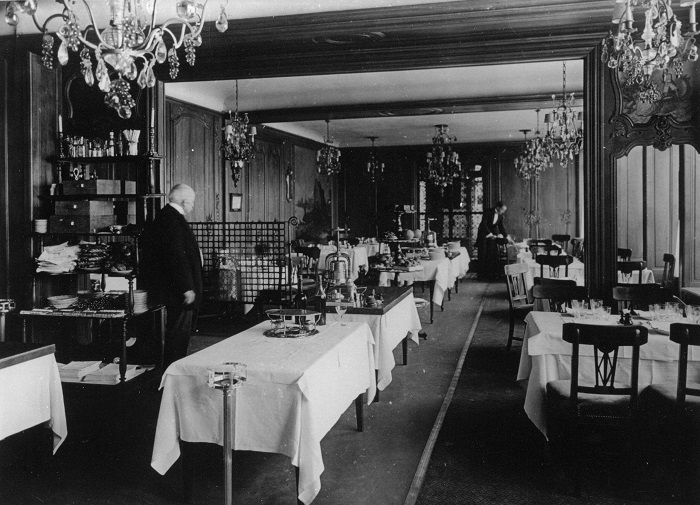 The Café Anglais was nothing less than the most fashionable and frequented of Parisian establishments of the time. La Tour d’Argent evolves and the restaurant covers itself with luxurious wooden panels. 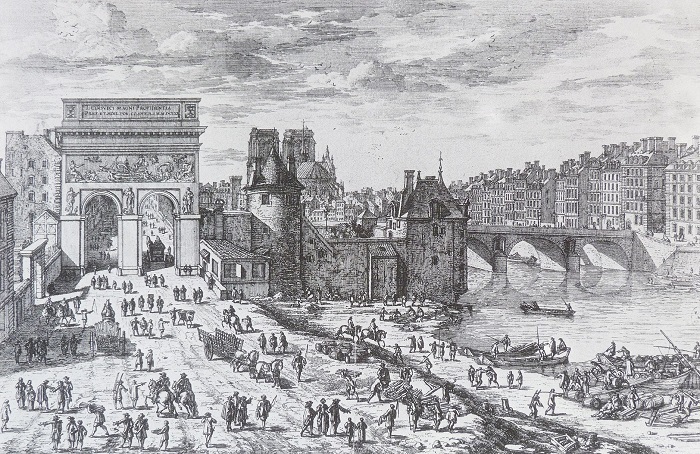 A sumptuous forged gate marks the new entrance, moved from the 15 on the quai de la Tournelle to the 15th, corner of the quai de la Tournelle and the rue du Cardinal Lemoine. André Terrail achieved what he had been planning for a long time. He added two floors to the building and heightened the Tour to the sixth floor to create the best panorama one could ever dream of. We can only appreciate the architectural marvels necessary to create the now familiar room, built on steel poles, without which the building would not have been able to hold the weight. To begin with, it was an open terrace, which was then closed off with an awning and then finally by huge bay windows. Gradually the Tour developed the structure it has today; the second room was open, the kitchens transferred to the sixth floor and a larger lift was installed.